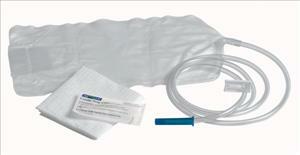 Designed with a spill proof valve on the 1500 cc enema bag and easy-use funnel top. 54" soft vinyl tube has a pre-lubricated, smooth, non-traumatic tip with rounded eyes for safety and easy insertion. Set also contains a moisture-proof, castile soap packet and a plastic shut- off clamp. Economy Enema Bag, Same as Above, Individually Bagged.